“Dilettante” column originally published twenty years ago on 09.01.1998 in the SF Bay Guardian. Re-intro September 2018 here. “CAN’T YOU ever just sit back and enjoy anything?” This was my father’s response to my enthusiastic retelling of the tricks and formulas I discovered (and thought I’d discovered) at the Ringling Bros. and Barnum and Bailey Circus when it came to Oakland last week. Circuses are one of the most breathtaking and imposing human spectacles around, Dad, but see, ever since gymnastic troupes and sideshow freaks started traveling in packs for safety and profit about 150 years ago, they’ve also been one of the most devious. According to Robert Bogdan’s Freak Show (University of Chicago Press, 1988), back in the days before moving pictures traveling circuses were the social highlight of the year in many rural towns. Circus workers would take the “rubes” (as they called townspeople) for everything they were worth: as the sideshow talkers would hawk freaks, tall men, small people, and armless wonders from “ballies” (podiums so tall that the yokels couldn’t see that they were being given the wrong change), professional grifters would roam throughout the bustling crowds picking pockets. When they weren’t taking financial advantage of someone else’s deformities or grossly misrepresenting people from the third world, sideshow managers spent considerable energy inventing entirely fake acts (Siamese twins bound by a corset, say) and mellifluous, convincing strings of dialogue to go along with them. 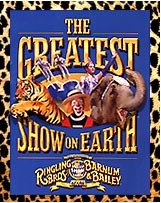 Although the Ringling outfit (“the Big One” in the circus biz) has the consistent reputation of being one of the least duplicitous circuses in the past century and a half, during the two-and-a-half-hour show, I couldn’t help but crane my neck time and again in search of The Catch. At the general-admission “Three Ring Adventure” before the show, kids were given the opportunity to trounce the circus floor, try on circus costumes, watch clowns put on their makeup (they don’t seem so scary after that), ooh and aah over baby elephants painting T-shirts with their trunks, and gape at and pose with Khan, the Tallest Man in the World. Tall men in the circus are traditionally made more imposing by being placed next to small people and presented as royalty: Khan’s eight-foot stature is enhanced by knee-high boots and a towering, vaguely Egyptian hat. A miniature-clown gymnastics show takes place directly at his feet. Mysticlese walks on a staircase of knives that don’t look very sharp. Marina, the “Lady in the Cube,” waves her arms around quixotically before assuming the fetal position and cramming herself into a clear box that’s not really that small. A guy called Vesuvio breathes gigantic clouds of fire — another exercise that looks harder than it is–and my companion and I strain to see the secret fans attached to his platform that we suppose must be literally fanning the flames. After the largely-exaggerated-to-fake talents of the sideshow, the real, lifetime-of-training athleticism begins. A woman named Katya is suspended from a rope (her safety wire’s not concealed very well) and does a series of one-arm flips that would rip anyone else’s shoulder right out of its socket. The gorgeous Gabonese Circus of the Equator flips, leaps, and builds human pyramids with fire to hypnotic tribal drumming. The Torosiants play the most surreal game of trampoline basketball I’ve ever seen, and other people fly through the air doing things I’d never attempt. Trapeze outfit the Tur ends their show with a supposedly extra-difficult catch-and-toss from one ring to the other. As the tossee reaches to be caught — although the lineup looks spot-on — the catcher holds his hands at his sides and the tossee falls into the net. They try again, and the same thing happens. I asked a circus hack that I know about the incident: “Part of the show,” he says. But twice — are you sure the one wasn’t messing with the other’s wife? “Part of the show. Those people are professionals, they’re with the biggest circus outfit in the world, and they don’t miss. Sometimes you want to be dazzled, and sometimes you want to see that it can’t be done.” That makes sense — if you can’t give ’em death, why not give ’em failure every now and then? The Quiros perform a stomach-churning high-wire act 30 feet in the air without a net. They run and jump; they balance with poles and on chairs; they almost fall three times. It’s so nerve-racking that I almost leave, but Circus Guy tells me that it’s impossible to fall from a high-wire if your feet are touching it (all you have to do is crouch and grab), and I should have only been nervous for the guy in the chair. As the Ringling Brothers clan knows, kids please easily, but the how’d-he-do-that factor and the knowledge that you’ve been had somehow is part of the perverted pleasure for adults. Bogdan says in Freak Show that local yokels at traveling circuses used to proudly compare how much money was ripped from their pockets, not even knowing that the bearded lady they’d just seen was a man in a dress. I’m sure I’ve been fooled, too. As the circus saying goes, there are two kinds of people: circus people and rubes. Hey, my wallet’s gone…. This is the 23rd piece in my “twenty years ago this week” project; this post’s intro is here, and Dilettante’s first installment is here.